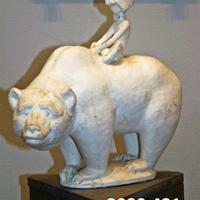 Small plaster model of the Two Bears. The surface is discolored in some areas. 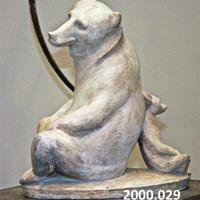 Sculpture depicts a black bear and a brown bear sitting back to back. Originally created for Lincoln Square, Urbana, Illinois, Victor Gruen, architect. Painted gray. 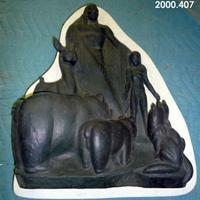 Plaster mother mold with inner rubber mold and plaster core. Written on mold is "Boy and Bear Stall A" There are several plastic zip ties banding the mold together. Small scale relief of Childhood Friends. Dark brown shellac coated. Some areas have new plaster. 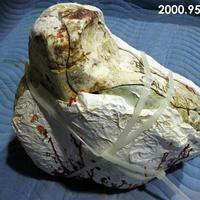 the antlers and feet of the girl, and may have been repaired. Marshall Fredericks designed these in hopes of getting a commission to be placed on a building out west. 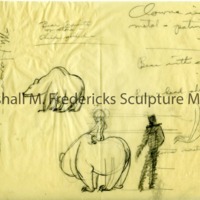 These are the only sketch models in the scale on one inch to one foot. They were intended to be about ten feet high. The plaster is painted black on this relief of Hiawatha. 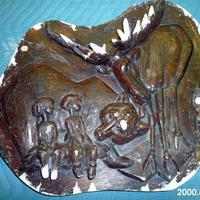 Plaster relief of moose, bear and Indian. Early sketch. 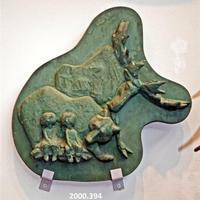 Green painted relief of the Childhood Friends. 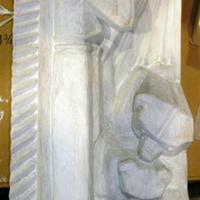 This model differs from the finished piece at Jefferson Memorial Elementary School, Wyandotte, Michigan. 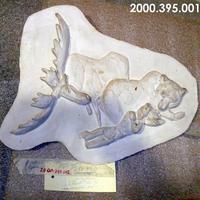 On this model the moose is facing to the right and on the finished bronze the moose is facing left. 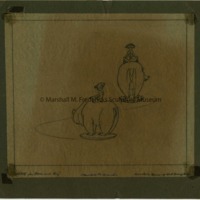 Study for "The Boy and Bear"
Sketch for "The Boy and Bear"